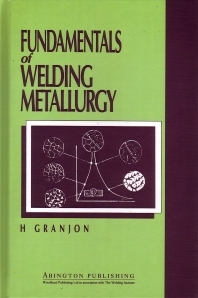 Metallurgical presentation of the general welding processes and characteristics; Thermal and thermochemical study of welding; Introduction to the metallographical examination of welds; Formation of the fusion zone; Solidification of the weld metal; Solid phase transformations during welding (heating); Solid phase transformations during welding (cooling); Hardening and cold cracking in steel welding; Heat treatments for steel welds; Metallurgical aspects of destructive and non-destructive weld tests. It is possible to weld materials as diverse as stainless steels, zirconium, titanium and uranium, but it is crucial to understand the chemical reactions likely in the surrounding welding atmosphere. This book describes all the metallurgical phenomena involved in different welding processes, from the most standard to the most modern, such as electron beam welding or high energy laser welding.